Whether you steal away for the weekend, find yourself in a storm, lose power, get lost, or just like to be outdoors; be prepared!! Lighting a fire can be the difference between life and death. The Easy Fire Starter's wooden handled fire starter kit is a must have survival tool in any situation. 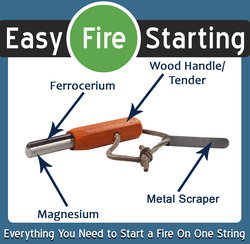 This tool has everything on one string to get a fire started even in the harshest conditions. Magnesium Rod - We only use top grade premium magnesium made in America. Our magnesium will burn at well over 5000 degrees Fahrenheit for easy fire starting. The magnesium shavings produce a flame at 5000+ degrees Fahrenheit helping ignite damp tinder to get the fire going. This feature is so important to getting a fire started in damp, wet, cold, windy or freezing environments. The magnesium rod is easy to shave with the attached scrapper, back of a knife blade or even a flat stone will do the trick. Ferrocerium Rod - This rod is reinforced and mounted right on the magnesium rod. The rod sends down a shower of sparks, at over 3000 degrees Fahrenheit on to the magnesium shavings to start a quick and powerful flame. Padauk Wood Handle – Not only does this handle help you get a grip on the fire starter to make shaving simple, flip it around and shave the handle to create a pile of tinder to start your fire. When everything around you is too wet, big, or just unavailable you will always have ever ready tinder for easy fire starting. Instructions - After gathering the larger pieces of wood, twigs, sticks etc. to sustain your fire it is now time to get it all started. Try to create a space or barrier where the fire starting is not directly in the path of wind or rain. Begin by arranging your tinder in a small pile, this can be accomplished by scraping the wood handle to produce shavings or gathering dry leaves and brush from the environment. Next shave the magnesium next to or in to the tinder, in harsher environments more magnesium may be required. Then scrape down the ferrocerium rod sending the sparks onto the magnesium shavings and tinder. When you see a flame it is time to BUILD your fire starting with small twigs, kindling wood and adding larger pieces of wood as the fire grows. Signal - besides easy fire starting the Easy Fire Starter serves as a signaling device which allows you to be located when boating, walking, hiking, hunting, or when your vehicle breaks down. The shower of sparks can be seen for up to 3 miles at night. A smoke-signal can be seen from several miles away. Fire Starter - Shave magnesium into a quarter size pile. Place fine tinder on magnesium. Scrape ferrocerium onto pile to ignite. Ferrocerium sparks at 3000 degrees F to ignite magnesium or tinder, magnesium burns at 5400 degrees F making it possible to ignite green or damp tinder. Tips - * Place tip of fire starter firmly on ground. * Hold scraper at an angle to the ferrocerium. * For best results, ferrocerium bar should be nearly touching tinder. * If scraper is lost, a knife, broken glass, chipped rock or any hard flat edge will work to scrape magnesium shavings. * Tinder Includes: moss, dead grass, pine needles, leaves, wood shavings, steel wool, cloth, paper, or shavings from the handle etc. Helpful Hints - * Make a pile about this size of a quarter for best results the pile should be at least 1/8 of an inch deep (eyeball it). * Be extremely careful when using a knife as a shaver/striker. If your knife has a locking blade or is fixed use the back side of the knife blade to avoid dulling the blade. * Use a straight, smooth, fluid motion both for shaving the magnesium off and striking the ferrocerium rod. *Know-how and confidence are keys to survival.